You are here: Home / Title Matters / Why Not? If you are currently an IEP or ITP designee you will not need to spend any time tracking your continuing education hours in preparation for the renewal of your designation because simply attending the ILTA convention each July will meet that requirement. It cannot be any easier to accomplish that aspect of your designation renewal than by your attendance at the convention! The convention gives both the seasoned title professional and the newest employee in the organization the opportunity to learn from the best in the industry. Illinois is so fortunate to have past ALTA Presidents and people that currently serve or have served on committees or are/were office holders in the ALTA in our midst. These individuals have background, contacts and information to provide even more dimension to the panel discussions. Just the simple meeting and networking with those in our industry is a value that will be carried away from the convention. 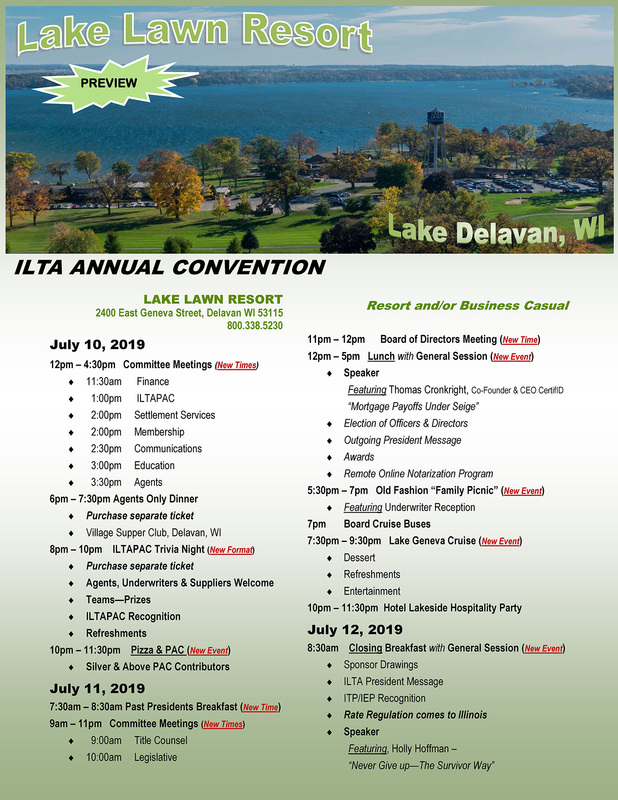 The ILTA annual convention is also a great opportunity to learn more about the ILTA PAC. You will learn what is occurring legislatively that affects our industry and how your support furthers these efforts. The Trivia Night on July 11 is an easy and fun way to contribute to PAC and have fun while doing so. Add to all mentioned, the opportunity to see vendors, meet the inaugural class of the Leadership Academy or going on a river boat cruise…there is only one question….Why Would You Miss the 2018 ILTA Annual Convention? See you there!